Most homes built after 1945 use drywall on the interior walls. Earthquake retrofit contractors who work on newer houses must understand the earthquake resisting characteristics of drywall as a shear wall material. All evidence shows it performs quite well. In view of this, it is quite odd that using drywall is not a significant consideration in new construction or in a retrofit system. Nor is it permitted by the building code if it is used in Seismic Design Category D. The Bay Area’s Loma Prieta earthquake and the Los Angeles Northridge earthquake both proved drywall can be used in retrofit designs. In addition, cyclic laboratory tests as shown in minute 5 of this video corroborate this fact. Using drywall as a shear wall material makes sense given drywall’s tested and empirically verified performance. Seismic retrofit contractors need to consider the existing capacity of drywall as much as possible in their designs. Doing so allows the designer to leave much of the structure undisturbed and thereby reduce cost to homeowners. The strongest geometric shape besides a triangle is a cube. A house’s floor, exterior walls, ceiling and roof create a cube. Inside this large cube is a honeycomb of smaller cubes consisting of bedrooms, bathrooms, hallways, etc. that are made with drywall. These rooms add another layer of earthquake resistance. This is the reason so little structural damage is seen to the walls, ceiling, and floor within living areas after an earthquake, even when a house slides completely off its foundation. This empirical evidence is a case where geometry, rather than code values, should be given some consideration. Tests on residential structures have been done on shake tables. Research scientists learned that drywall performed much better than expected. “We saw minor drywall cracks from window and door corners,” said Steve Pryor, S.E., Simpson Strong-Tie lead researcher for the project. “After the first four tests, the fifth and largest test showed only a very slight increase in the amount of drywall cracking and there was very minimal nail withdrawal.” The reason they were surprised is that the “whittled away” building code predicted the damage would be much more significant. 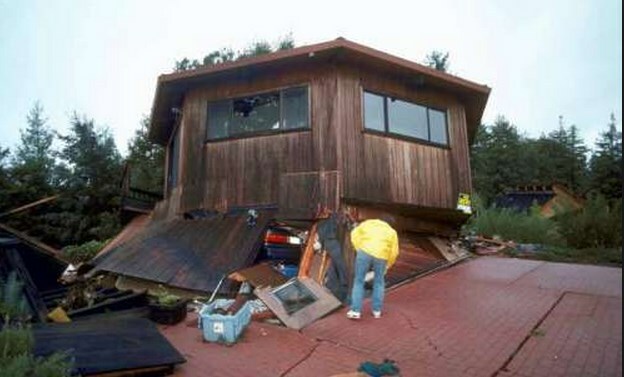 Here is a photo of a newer soft story house in Santa Cruz that fell eight feet during the 1989 Loma Prieta Earthquake. The shear capacity of the drywall caused it to maintain its shape. None of the windows even cracked. If drywall can protect houses like this from imploding, retrofit contractors should recognize drywall’s considerable earthquake resisting capabilities. A Damaged House in Santa Cruz. This does not mean there will be no damage. Earthquakes cause drywall to crack. Cracks usually radiate from the corners of doors and windows in interior walls because openings in doorways and windows have less earthquake resistance than solid walls. Drywall damage was the most common structural damage after the Northridge Earthquake, but the damage was minor, caused no injuries, and was easy to repair. Much of Northridge has housing stock similar to the that found in San Jose, so in the Bay Area we can expect the same. Below is a table from the 2013 California Building Code and provides shear strength values for drywall. This information should be used by seismic retrofit contractors in San Jose and the San Francisco Bay Area. It was adopted in its entirety from the International Building Code, the code currently in use throughout most of the United States. Shear walls sheathed with portland cement plaster, gypsum lath, gypsum sheathing or gypsum board shall not be used to resist seismic forces in structures assigned to Seismic Design Category D.
The green and red arrows are in the THICKNESS OF MATERIAL column for drywall that is ½ inch thick. The blue and purple arrows are for drywall that is 5/8 inch thick. The FASTENER SPACING MAXIMUM column tells us how far apart the nails and screws can be. Footnote b is important to note because it specifies that the top, bottom, and sides of the drywall must be attached to framing for it to be defined as a shear wall with earthquake resistance or shear value. This is analogous to plywood shear walls where the same nailing specifications are required. The column WALL CONSTRUCTION describes the wall framing. into which the drywall is nailed or screwed. It is broken into two types: blocked and unblocked. “Blocked” means the drywall is fastened to the framing on all its edges: top, bottom, and sides. 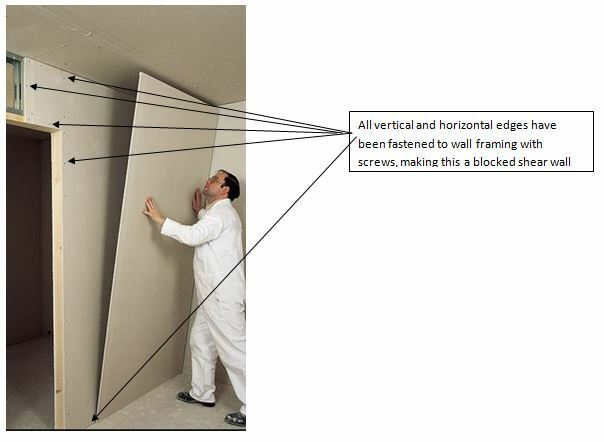 If there is blocking behind horizontal seams where two edges of drywall meet, the drywall edges must be fasted to this blocking in order to be considered a blocked shear wall. As seen in the table above, the blocked and unblocked ways of installing drywall make a tremendous difference in shear capacity. When drywall is installed vertically where the top, bottom and sides are fastened to the wall framing as illustrated below, it has the shear value of a blocked shear wall. The horizontal unblocked method is by far the most common one used in San Jose because it creates fewer seams that need to be taped with drywall compound and is therefore cheaper. When evaluating the earthquake resistance of newer previously installed drywall such as those built in San Jose and the surrounding areas, it can be assumed to be an unblocked drywall shear wall. Unfortunately, we must be immediately suspicious of the information provided in this table because of a glaring error. 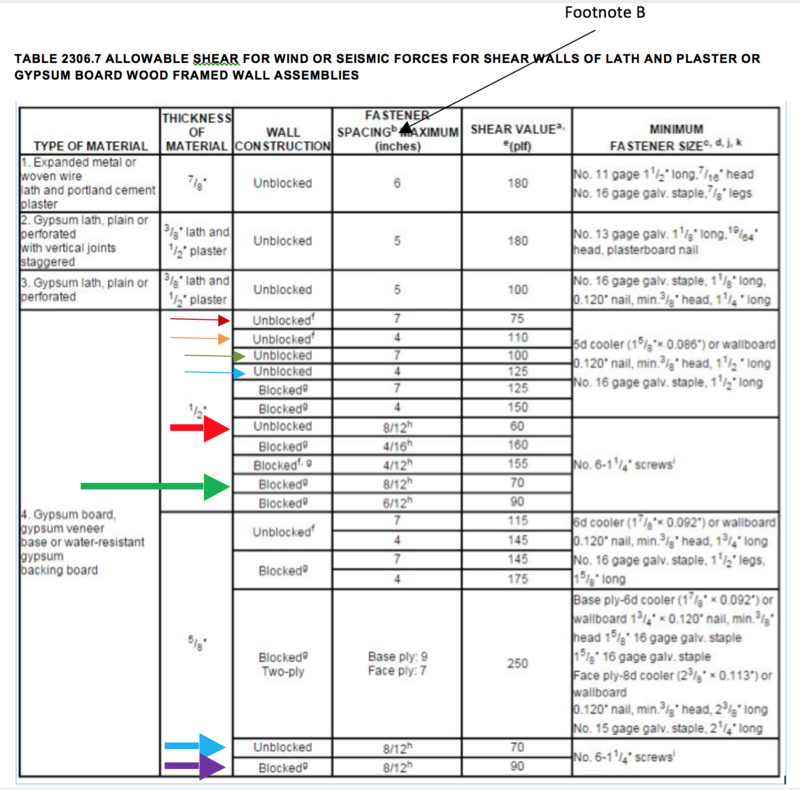 The red arrow specifies an unblocked shear wall with nails 7” apart on the edges and all other framing members, which gives it a 75plf shear value. Footnote f says framing members cannot be spaced more than 24 inches apart. The orange and blue arrows point to the same problem. The interior walls of almost all houses in San Jose, Walnut Creek, and Santa Clara, as well as the newer parts of the South Bay such as Redwood City and San Mateo, are covered with with drywall shear walls. 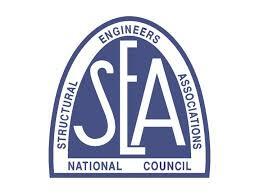 San Jose seismic retrofit contractors must take the strength of drywall into consideration. This table is used by jurisdictions representing some 250 million people and supposedly went through thorough intense vetting by experts in the industry and building department. Given how obvious this error is, I think it would be prudent to check whether the information in the rest of this table is accurate. Tests for drywall shear values conducted by the gypsum industry provided results that are much different than the shear values listed in the building code. Comparing these results with the information in the code gives us more insight into the shear values seismic retrofit contractors in San Jose should be using. 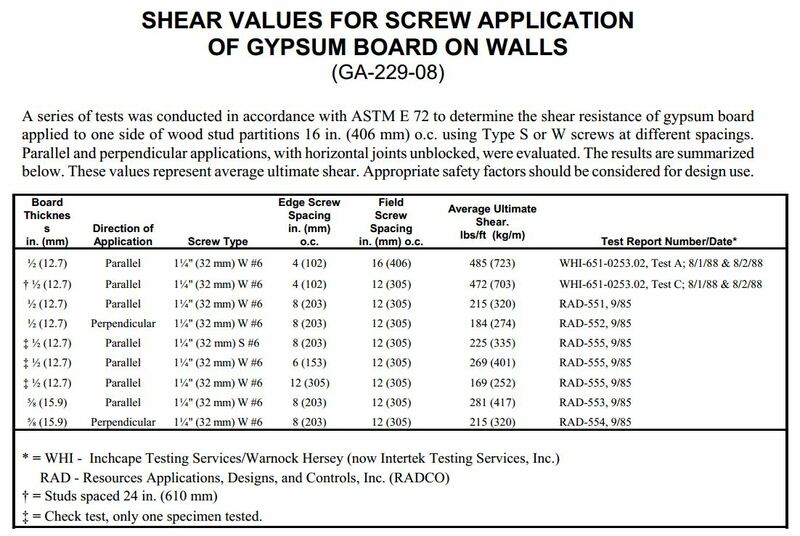 The shear wall table below exhibits Gypsum Association test results published in 2008. The Association’s confidence in their validity has not changed. It must be noted this table represents the ultimate shear values of drywall. These values represents the amount of force that is applied before the earthquake resistance of the drywall falls sharply from the maximum shear value represented in the table. For example, if one foot of drywall reached a failure point after being subjected to 400 pounds of shear force; it would have an ultimate shear value of 400 pounds per foot. The definition of “failure point” is an arbitrary decision by the code writers. To this tested ultimate shear value the building code applies a reducing safety factor. The tested value multiplied by the reduction factor equals the drywall shear value that San Jose seismic retrofit contractors are allowed to use when evaluating the earthquake resistance of a house. This reduced value is known as allowable value, meaning the value allowed by the building code, in contrast to the ultimate value, which is the tested value. What is a Safety Factor? As a rule, building code developers look at test reports done on products like drywall and operate under the assumption that these tests do in fact represent accurate shear values when installed under laboratory conditions. However, “in the interests of safety,” outside the laboratory they assume the worst regarding the installation; such as defective material, an incompetent contractor, a building inspector who did not notice the drywall was installed improperly, a designer who miscalculated the amount of force that was going to hit the wall, or some combination thereof. This can have significant consequences. 1/2 inch drywall screwed 8 inches on the edges and 12 inches everywhere else is rated by the code as being able to resist 60 pounds per linear foot while actual tests have proven it can resist 215 pounds per linear foot. The reason for this is because the tested value was multiplied by a safety factor of 72%. Direct observations of damage conducted after actual earthquakes have proven the effectiveness of drywall, which is a glaring indication this safety factor is much too high. After extensive research, the author of this article has yet been able to discern the reasoning behind such an extreme safety factor, especially when previous earthquakes as well as tests on shake tables have shown these allowable values should perhaps be higher than the tested values, or at least greatly increased beyond the values currently found in the code. This investigator came to the conclusion that shear values in the code are arbitrary values based on the biases of the decision makers who write it. Some construction materials will have a 25% reduction factor while some have a 72% reduction, which gives one the impression it is entirely arbitrary. Best to evaluate empirical evidence provided in the most accurate laboratory of them all, an actual earthquake, and forget the rest. The code process after every earthquake looks something like this: there is a public outcry to building officials. “Do something!” One of them gets up to the mic and says they will now make building standards more stringent by reducing the shear values of drywall. The public is happy. The building departments have done something! Do this over and over again and drywall’s shear value keeps going down and down. Of course this has no basis in science, but then again, these decisions are rarely made by scientists.